Allison Druin is the University of Maryland's first Chief Futurist for the Division of Research and Co-Director of the Future of Information Alliance (FIA). Druin’s focus is not on predicting the future, but on preparing for it, conducting research with faculty and students campus-wide. Druin is also a Professor in the University of Maryland's College of Information Studies and HCIL. 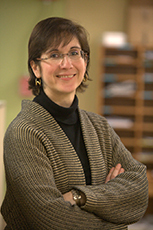 Previously she was Director of the Human-Computer Interaction Lab (HCIL). Druin’s research over the last two decades has focused on developing new technologies for children, with children as design partners. With her team, she has helped to develop new educational technologies with such partners as the U.S. National Park Service, Sesame Workshop, Nickelodeon, Nokia, UNICEF, and many others. For this work, her team has received numerous awards from such organizations as the Association for Computing Machinery, the American Library Association, and the Academy of Television Arts and Sciences. For the last six years, Druin has been a monthly technology radio correspondent on WAMU (88.5)'s Kojo Nnamdi Show, Tech Tuesday. Druin received a B.F.A in Graphic Design from Rhode Island School of Design in 1985. She then went on to complete a Masters Degree from the MIT Media Lab in 1987. And she was awarded her Ph.D. in 1997, from the University of New Mexico. This is a big week for the FIA. The FIA is teaming with the National Park Service, National Geographic Society, the Smithsonian Institution, WAMU 88.5, and the Newseum to host a variety of events that explore the information treasures that make up vast parts of our cultural heritage in danger of being lost, forgotten, or neglected. With support from the Robert W. Deutsch Foundation and the University of Maryland, the FIA and its partners welcome “Future-ists” who are on the cutting edge of exploring these issues, ranging from innovative uses of satellites and 3D imaging, to confronting the challenges of archiving social movements and early children’s television. The FIA is making use of live-streaming and social media to capture this week’s events. Learn more here.